No need for a monday to be boring! Every monday at Eastseven Berlin hostel there is a free vegetarian dinner party organized for all guests staying at the Hostel. It´s a really nice happening, an opportunity for travelers to meet other travelers. Here is how it works; you need to sign up at the reception till 3pm on monday. Then meet up with the crew in the kitchen at around 7pm . If you like you could even join in on the cooking, or bring your own ingredients. We sell cheap but good german and chech bier at the reception! Singer/songwriter Jennifer Logue once did a performance on a monday at the EastSeven Lounge, a volunteer show. We filmed during here show, just check out our youtube video. At that time she was touring across Europe with her `Paint the World Pretty Tour` staying at different hostels and performing for free in hostels and in orphanages aswell! Our friend Todd, from the amazing band Calico Soul (Hawaiian / Rock / Punk music), is also a well seen musician at our hostel. And if you are lucky you might even catch him playing on the guitar during one of our monday-evening happenings. And as usual our cook Florian will be there on mondays, cooking delicious vegetarian meals! To join and enjoy the cooking come to the Hostel Kitchen at 7pm. So hope to see you all soon at the EastSeven Berlin Hostel. Every monday at Eastseven Berlin hostel there is a free vegetarian dinner party organized for all guests staying at the EastSeven Berlin Hostel. It´s a really nice happening, an opportunity for travelers to meet other travelers. Here is how it works; you need to sign up at the reception till 3pm on monday. then meet up with the crew in the kitchen at around 7pm . If you like you could even join in on the cooking, or bring your own ingredients. We sell cheap but gut german and chech bier at the reception! Singer/songwriter Jennifer Logue did a performance once at the EastSeven Lounge, a volunteer show. We filmed during here show, just check out our youtube video. If you want to support Jennifer Logue visit her website and read more on how to do so! The EastSeven Berlin Hostel is THE small and relaxed Hostel in Berlin – the ideal place for travellers seeking the true spirit of Berlin. Relax in the Hostel´s beautiful garden after strolling around lively Berlin districts Prenzlauer Berg and Mitte. Staying with us puts you right in the centre of these vibrant districts with their exciting sights. 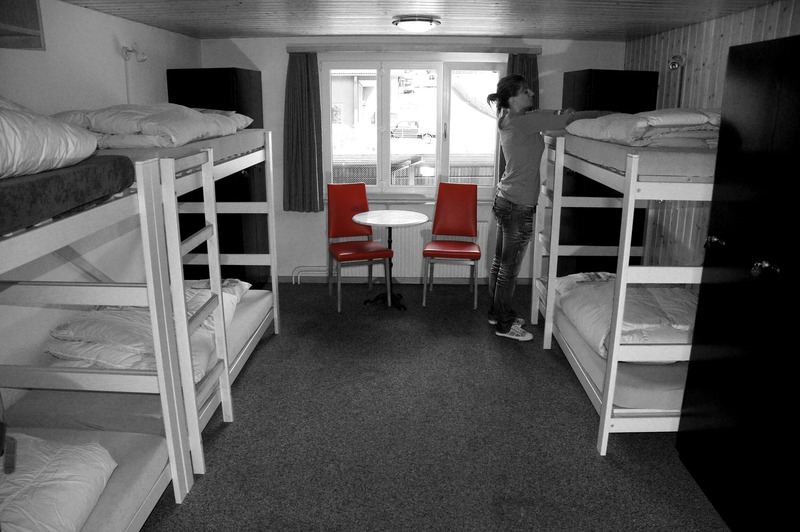 Experience the difference to a big Hostel! The EastSeven Berlin Hostel is easy to reach from all Airports and Train stations (U2 – Senefelder Platz) in Berlin. The Hostel is situated in the heart of Central Berlin – surrounded by cafés, restaurants, theaters, nightlife and of course lots of Berlin style shops (Kastanienallee, Kollwitz Platz etc.). The Main cultural attractions (Museum Island, Alexander Platz/TV Tower, etc.) are within walking distance from the EastSeven Berlin Hostel. Visit also our directions page. The EastSeven Berlin Hostel has opened in April 2005, so it´s fairly new and offers plenty of private rooms (single/ double/ tripple/ quad) and small dorms (max. 8 people)!! Spacious bathrooms with strong + hot showers 24h, are provided on every floor of the Hostel. The big self catering kitchen as well as the lounge are located in the Hostel´s cozy garden-house. We even supply you with baby beds for your kids and offer a 4 bed room with private facilities for disabled people. To get an even better impression of the EastSeven Berlin Hostel, we have made a video. Interviewing guests on how they experience our hostel and showing our garden, kitchen lounge and rooms. Enjoy wathing the video and hope to see you soon in Berlin!! Its a fun event and a nice opportunity to meet other travellers! So do all to have a bed on monday at EastSeven Berlin Hostel. Of course the food is for FREE, but you should register till monday15:00. We have made a selection of some really amazing shops close by the EastSeven Hostel. In the beautiful kastanienallee there are lots of cool shops. Some with designer clothes, vintage furniture, souvenirs etc.etc. Go there for a stroll! As an EastSeven guest you can get amazing discounts at some of these shops. Therefore you should take the Local Disount Card (ask for it at the reception) with you, and explore the neighbourhood by shopping! They do not only sell beautiful clothes, dark sunglasses & toys…………they even have ice cream, enjoy it on there lovely terrace in the Kastanienallee. They sell from earings, to postcards, from souvenirs to unique designed clothes…anything you can imagine. All made by different Designers. The shop has a gallery, a small factory, a seminar room and a lovely garden. It´s really worthwhile taking a closer look inside this cosy shop in the Oderbergerstrasse. This is one of the coolest vintage-shops in Berlin. They sell over thousands of secondhand shoes and have an exclusive selection of furniture & clothes from the 40´s till the 80´s. Check it out for yourselves! Also check out our youtube-video to get an even better impression. We have made a new hostel video representing the EastSeven Berlin Hostel staff…. It is a really short movie just to give travellers a better impression of the hostel and her staff. Our staff is always really friendly and, as you can see in the movie, really cool!!! From 7am till midnight they are there for the guests, at the reception. Always helping the traveller finding the best clubs, parties, sightseeing tours etc. etc. (see also the individual staff recommendations online). You can come to them with any question, problem, or just for a nice conversation. They also sell the best german beer and italian coffee. There is a happy hour for coffee during the morning from 8-10 and there is a happy hour for beer in the evening from 8-10. At this time there are already 6 hostel movies online on various video platforms as youtube, daily motion and vimeo.